Centro Arenys is located in North Eastern Spain, in the Costa Brava, near the French border and the Pyrenees Mountains. The Centre is situated in the very small town of Arenys d’Empordà in the province of Girona – Catalonia. It is out in the country surrounded by fields and woodlands. The property includes an extensive forest that is conducive to prayer and solitude. There are many places of natural beauty that we hope will be an inspiration. The river Fluvia marks the perimeter of the property which covers some 6 acres. The Centre can accommodate 100 people in dormitories and double rooms. Groups of any size can be accommodated, from a small family vacation to a large conference. A full board service is normally provided but the kitchen can be run by your own catering team on request. We are 13km from the nearest town Figueres, 20 km from the beach – Costa Brava, 30 km from the French Border and 120 km from Barcelona. The Girona-Costa Brava Airport is only 40 km away. By road – from France. If you take the Motorway AP-7 – Take the Exit 4 Figueres Sud. As you exit, at the first roundabout take the 2nd exit to N-II (N-2) southbound and after km 746 take the left turn to GIV-6226 Garrigàs-Palau Sta. Eulalia. After 5’800 km you will reach the River Fluvià. After the river crossing it’s the first building on your left and the main entrance gate is opposite the km 6 sign post (200 m from the river). If you take N-II (N-2) after km 746 follow the above instructions. By road – from Barcelona. 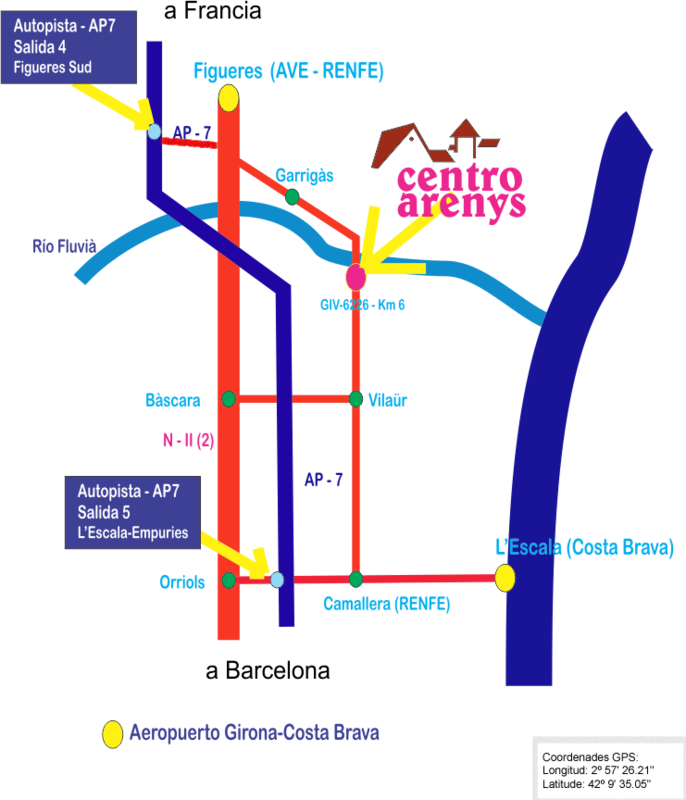 If you take the Motorway AP-7 – Take the Exit 5 L’Escala-Empuries – Turn right and at the first roundabout take the second exit and take the N-II (N-2) northbound. At Bàscara turn right to St. Mori and after about 4 km at the first roundabout take the 3rd exit to GIV-6226 to Garrigàs and after 2 km at km 6 sign post you have reached Centro Arenys. If you take N-II (N-2) at Bàscara follow the above instructions. By slow train from Barcelona: Station: Camallera. By fast train from Barcelona: Figueres-Vilafant. By air: Airports Barcelona or Girona-Costa Brava.